These days it’s ordinary to cool off with a magenta popsicle or quench thirst with a neon green sports drink. Vibrantly colored foods have become the norm, but studies show that popular food dyes carry profound risks. 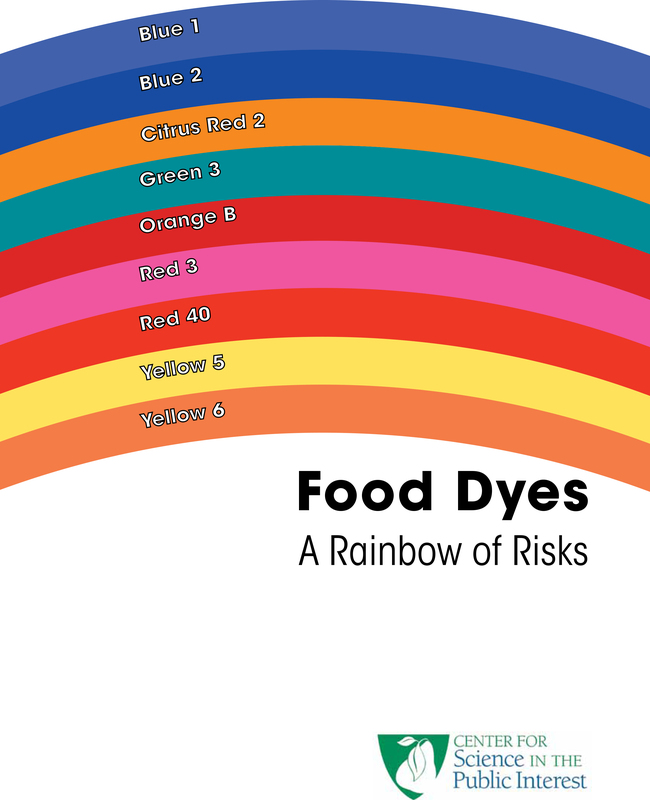 The Center for Science in the Public Interest (CSPI) recently published a comprehensive report called “Food Dyes: A Rainbow of Risks” which details the inherent risks of nine different dyes widely used in common foods. The report reveals that common food dyes pose risks of cancer, hyperactivity in children, and allergies. The food industry dumps over 15 million pounds of the dyes studied into the food supply each year. Three of the dyes carry known carcinogens, and 4 can cause serious allergic reactions in some consumers. New studies show that seven of them contributed to cancer in lab animals, including brain and testicular tumors, colon cancer, and mutations. CSPI mailed a letter to the Food and Drug Administration (FDA) last week detailing a request that food dyes be banned in the United States to protect consumers. CSPI charges that the FDA is failing to enforce the law in the following ways:- ”Red 3 and Citrus Red 2 should be banned under the Delaney amendment, because they caused cancer in rats (some uses were banned in 1990), as should Red 40, Yellow 5, and Yellow 6, which are tainted with cancer-causing contaminants. CSPI charges that the Food and Drug Administration (FDA) knows about the health risks imposed by the presence of these dyes, but has not acted to protect consumers. Despite the risks, Red 3 remains in our food supply today, with over 200,000 pounds poured into processed foods each year, including ConAgra’s Kid Cuisine frozen meals and Betty Crocker’s Fruit Roll-Ups. Experts admit that in order to conclusively state the extent of harm imposed by these dyes more comprehensive testing should take place. 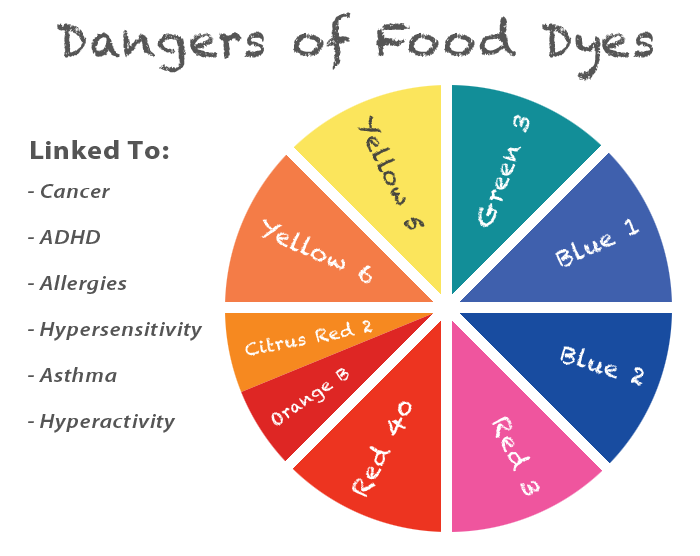 Many consumer advocacy groups are calling on the FDA to carry out its own tests on the dyes if the results of these other tests are not conclusive. British lawmakers reacted to the findings of these studies and already forced companies to phase out the harmful dyes served in Britain before January of this year. Additionally, the European Union passed a law that goes into effect on July 20 requiring companies to post a notice on each dyed product sold in Europe. The notice states, “May have an adverse effect on activity and attention in children.”This law is expected to encourage the companies still using these dyes to completely eliminate them inside all of Europe over the next year. Color is used to attract consumers, and the good news is that synthetic, petroleum-based dyes are not irreplaceable. There are a lot of natural dyes that can be used to brighten food. Blueberry juice concentrate, carrot juice, paprika, grape skin extract, beet juice, purple sweet potato, corn, and red cabbage are just a few alternative dyes. CSPI names a few stark differences in foods served in the United States and Europe in the report. In Britain, Fanta orange soda is dyed with pumpkin and carrot extract while the U.S. version is dyed with Red 40 and Yellow 6. Kellogg Strawberry NutriGrain bars are colored with Red 40, Yellow 6 and Blue 1 in the U.S., but with beetroot, annatto and paprika extract in the UK. McDonald’s Strawberry Sundaes are colored with strawberries in Britain but with Red dye 40 in America. Consumer advocacy groups are calling on the FDA to enact similar policies in the United States. These groups argue that we deserve real strawberries too.